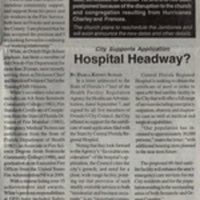 A newspaper article published in The Oviedo Voice on September 16, 2004. The article discusses the appointment of Lars White as acting fire chief of the Oviedo Fire and Emergency Services Department until the city finds a permanent replacement for its retiring chief, Wayne Martin. According to the article, White was considering applying for the permanent position of fire chief. White was hired as one of the department's first paid employees in 1983, after serving for several years as a volunteer. His experience included service as a firefighter, a captain, a lieutenant, a battalion chief, the public information officer, a training coordinator, the public education director. The article also discusses the appointment of Cindy Lindsay as Finance Director. A certified public account, Lindsay's experience also included service as the assistant for the Oviedo Finance Department, service for the City of Casselberry, and experience running her own business. Original newspaper article: "City Appoints New Fire Chief, Finance Director." The Oviedo Voice, Vol. XIV, No. 38, September 16, 2004, page 1: Private Collection of Edwin White and Carolyn White. Digital reproduction of original newspaper article: "City Appoints New Fire Chief, Finance Director." The Oviedo Voice, Vol. XIV, No. 38, September 16, 2004, page 1. Originally created by Darla Kinney Scoles and published by The Oviedo Voice. This resource is provided here by The Oviedo Voice and is provided here by RICHES of Central Florida for educational purposes only. Robison, Jim. Around Oviedo. 2012.; "History." City of Oviedo, Florida. http://www.cityofoviedo.net/node/68. Scoles, Darla Kinney. “City Appoints New Fire Chief, Finance Director.” RICHES of Central Florida accessed April 25, 2019, https://richesmi.cah.ucf.edu/omeka/items/show/6346.